The gemstone finishing process starts with shaping the stone into a shape that works best for the intended setting. 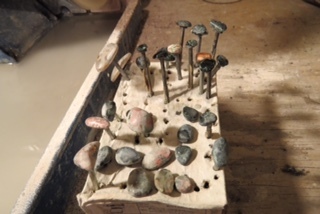 Once the gemstone is shaped, it's then glued to a dopping stick. A dopping stick helps to hold the stone for exact precision while polishing it. The stone is then brought through a series of sanding steps known as grit levels. 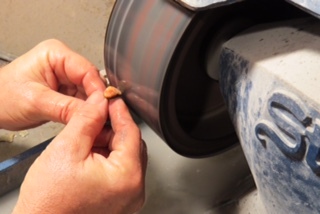 A typical gemstone will start off the shaping steps with a 220 grit diamond wheel, then move up in grit using these steps on resin bonded soft grit wheels: 320, 400, 600, 800, 1000, 1200, 8000, 50,000. 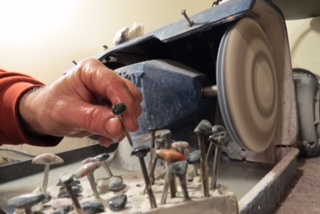 Each time the grit is increased, a different wheel is used, and keeping track of the steps and knowing when a stone is ready to change steps is learned by practice, and this practice is known as the art of lapidary. It's likely that a finished gemstone has gone through 9 polishing steps after being cut and extracted from the host stone. 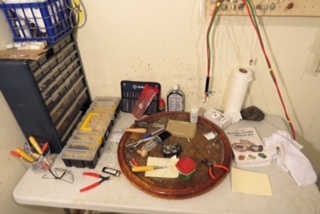 A host stone is the hard trap basalt that holds the gemstones. 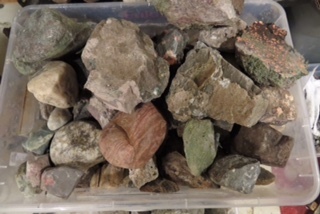 Extracting these stones is difficult even with the proper diamond cutting machines.